The Health Workers Union (HWU) represents residential & support workers, administrative and clerical workers that work within Victoria’s Private and Not-For-Profit support services sector. We also cover other occupations that work within the support services sector. If you would like to become a member of the HWU please call our call centre or go to our online HWU Application form. We have been working hard to make sure that our members and other workers get paid appropriately for the difficult and often rewarding work that they do. We have also been campaigning for better work conditions such as more staff per shift and better patient management plans that involve regular input by medical and allied health professionals. With the NDIS currently being rolled out across Victoria, we have been working closely with the government to make sure that we will have a quality disability sector that provides best practice treatment for patients and respects the workforce for the great work that they do. In order for us to make sure that our views are heard, the HWU is represented on the NDIS Implementation Taskforce and Workforce Development and Transition Working Group. Ministers Foley (Minister for Aged Care and Disability) and Jennings (Special Minister of State) chair the taskforce that we have been attending for almost a year. We encourage all our members to provide us with feedback in relation to how the residential & support services sector can be improved so that we can make sure your voices are heard at the highest level. We will also incorporate your ideas in the Enterprise Bargaining Agreements that we are currently negotiating with various employers. A new workplace Agreement covering MacKillop Family Services has now been voted up by members. This Agreement is now awaiting certification from the Fair Work Commission. December – an increase that comes from the Equal Remuneration order. The increase will apply in full by 2020. Most of you would have heard about Victoria’s Royal Commission into Family Violence (2016) and the findings that came out of this very important inquiry. In brief, the Commission’s report called for the development of a 10-year Family Violence Industry Plan with the view of identifying and fixing the inadequacies of the current way our health services deal with domestic violence. The Victorian Government is developing a 10 year Industry Plan as a key recommendation of the Royal Commission into Family Violence. But for this to be possible, a clearer picture of all workers who, in some way, interact with family violence is needed. That’s why Victoria’s first family violence workforce census has been developed. The census is for everyone who plays a role in preventing, identifying and responding to family violence in Victoria. It represents a landmark opportunity for the voices of the workforce to be heard. Are you an aboriginal health worker, GP, dentist, or nurse? Or perhaps you work in community health, disability, aged care, or public health? 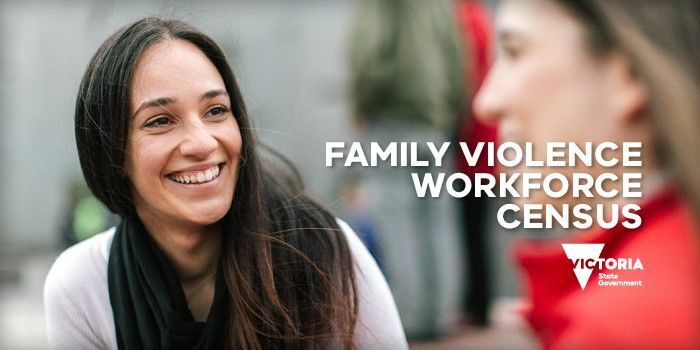 Whatever you do, there’s a high chance that you encounter family violence throughout your work ‐ so your input is needed. The census will collect information related to working conditions and remuneration, qualifications, access to professional development and supervision, workload, and health and well-being. This is an important chance to have your say on your work and what you need to support you. Your input will help government to plan for the future, and to understand and address workforce challenges. The census will take no longer than 20 minutes to complete, and can be accessed from work, home or on your handheld device. Complete it now, or put a reminder in your diary! The survey is open until 5 May 2017. To complete the census, please visit https://vicfvcensus.questionpro.com/. For further information, FAQs, and information about support services, please visit http://www.vic.gov.au/familyviolence/workforce-census.html If you have any questions about the survey questions or are experiencing technical issues please contact KPMG at AU-FMFVCensus2017@kpmg.com.au or by phone at 03 9838 4750. The Victorian Government has released an enterprising scheme that aims to break down the barriers people with a disability continue to face. Absolutely Everyone: State Disability Plan 2017-2020 comes in to effect from 1 January 2017. The Victorian government strategy will support and include people with a disability. leadership scholarships to see more people with a disability involved in decision making and more. You can access the plan online here. These scholarships provide 100% free tuition for the relevant, nationally-accredited Certificate and an opportunity to kick start your career – or deepen knowledge and skills. If you work within the disability sector and are keen to study, please speak to your employer. With their assistance, you can apply for a scholarship.